That injunction is a guidepost for the partnership of violinist Luis Grinhauz and pianist Berta Rosenohl, in love and music and their life and work together. It is on the wall of their basement rehearsal space in their cozy Côte St. Luc townhouse, and it reflects the way they have navigated life’s trials together. 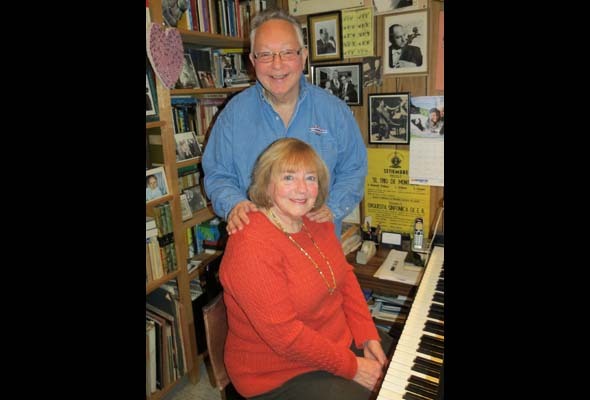 As they prepared for a 49th Valentine’s Day together as a married couple and musical collaborators, they reflected about the joy they share. You can see it in the unsentimental yet glowing way they describe working together as pillars of Montreal’s classical music scene, mainly as the heart of Musica Camerata chamber music ensembles, and in a trio with their son, American cellist Léo Grinhauz. The romance began in 1961, after a concert by Argentina’s National Symphony Orchestra, when Grinhauz and Rosenohl were introduced by a violist from Lithuania. Rosenohl was a medical student but soon chose music as her career. Her father, a denturologist, came to Argentina from Austria “on a bet. He and a friend decided to run around the world.” Her mother, an actress in the Yiddish theatre, was from Warsaw. His father, an amateur fiddler, became a barber and they lived in Paraná, 400 kilometres north of Buenos Aires. The conservatory where he studied showcased his talent as one of its prodigies. In spite of his family’s humble circumstance, Luis was sent at 14 to study in Buenos Aires with pedagogue Humberto Carfi, an exponent of the Italian violin school. “I lived in rooming houses and supported myself by playing in the Youth Orchestra,” he recalled. At 19, he was hired as a violinist with the National Symphony Orchestra in Buenos Aires, then met and married pianist Berta. In 1968, both received scholarships for advanced training at the famed music school at Indiana University in Bloomington, where he studied under the noted Russian-born Josef Gingold, who favoured the elegant 19th-century style of violin performance. When a violin chair opened in Montreal, Grinhauz was hired by then-director Franz-Paul Decker. The Musica Camerata ensembles began in the early 1970s as private concerts by MSO musicians at a music lover’s home. By popular demand it was expanded to performances at the old Hermitage concert hall on Côte des Neiges Rd. In 1983, Grinhauz became artistic director and overall manager of the Camerata program, which has support from the Conseil des arts de Montréal and several donors. While avoiding compositions broadly considered avant-garde, Camerata every year presents a newly composed work. At its concert April 5, it will perform Variations for Friends for string quartet and piano, composed by Montrealer Stewart Grant. “It’s a very good composition and yes, there is some dissonance, but dissonance is just a colour in the sound. Beethoven, Mozart and Bach were also dissonant,” Grinhauz said. “Our raison d’être is to play works that are not known, neglected, or forgotten,” he said. They will also perform the rarely played Dvorak Quintet No. 5, in A major, which they first played in 1992. They will also premiere a quintet by the British composer Frank Bridge. Musica Camerata performs quintets by Dvorak and Bridge, and the new work by Grant at 6 pm April 5, at the Chapelle historique du Bon Pasteur, 100 Sherbrooke E., with its wonderful acoustics and Fazioli piano. May 10, Camerata presents quintets for piano and strings by Ernö von Dohnányi (Op. 1) and Gabriel Fauré (Op. 89), with cellist Leo Grinhauz. Tickets cost $30, seniors and students pay $20. 514-489-8713. Be the first to comment on "Love and Music: 88 keys to keeping romance alive"